I have this photo blog called Jakarta Daily Photo and I have a lot of foreigners appreciating the blog because it shows the beauty side of Jakarta. One of the comment I got is from Saphia, a French girl who’s coming visiting Jakarta for work related and would spend months here. 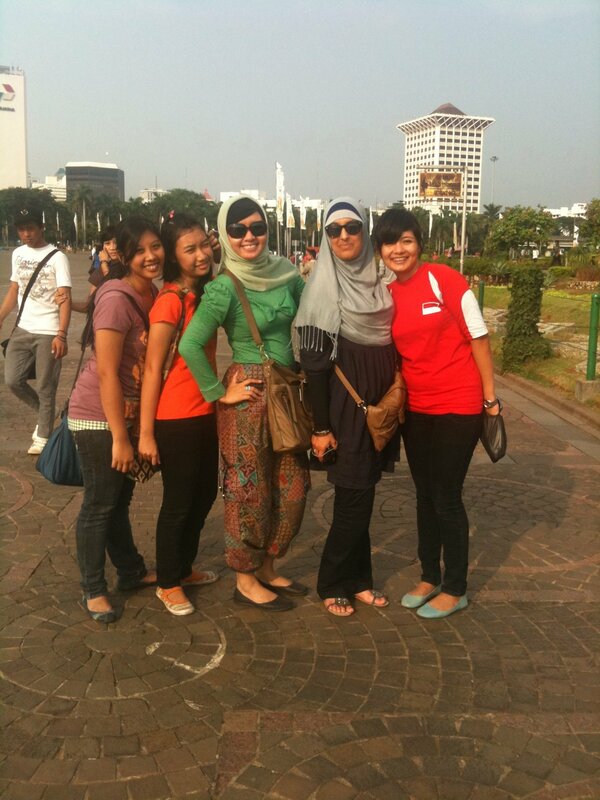 We met at National museum (along with her friends and also my new friends) and it’s my first time there. Local Jakartan don’t really come to museums hehe. Then we went to eat some Indonesian food. While eating her too-spicy-according-to-her nasi cobek, I learned that Saphia really grateful she could eat a halal Burger King in Jakarta. It’s the first time she ever eat Burger King. I was like… Wow… I never think of that. It could be a good travel campaign: come and eat halal fast food! So we walked and cycling around the monument. It’s super fun! We go to Masjid Istiqlal, the biggest mosque in SouthEast Asia (so they say), also my first time here (pity me) and we spend time there for prayers. Here I just realized that in Mekkah or Madinah, I never get to see Imam because we’re way behind. In here, I’m praying at front row! I’m enjoying my time with her, train my ear for French words, and happy to see Jakarta from other point of view. We agree on 2 things about Jakarta: traffic is horrible and why the city don’t have some sort of MRT. Well, this time I can’t say a thing and prefer to sip my iced lychee tea. Women: Should You Hold Back? A writer of 30 books. Co-Founder & CMO Storial.co & NulisBuku.com. Initiate StartupLokal, the biggest startup community in Indonesia. Co-Managing Director of Girls in Tech Indonesia.